This week’s Diva challenge “UMT – MacDee by Anneke Van Dam” was fun. I had to do color for this one. I mean really, the plaid just screamed out for color. Luckily I had been playing with the sprays that I bought from Pat. I had some leftover spray on my craft sheet and mopped it up with my sketchbook paper. Love the orange and pink together. I think it would make a really cute plaid skirt – if it were fabric. I agree with Kia, especially with your use of colour. Like your color wash in this tile. 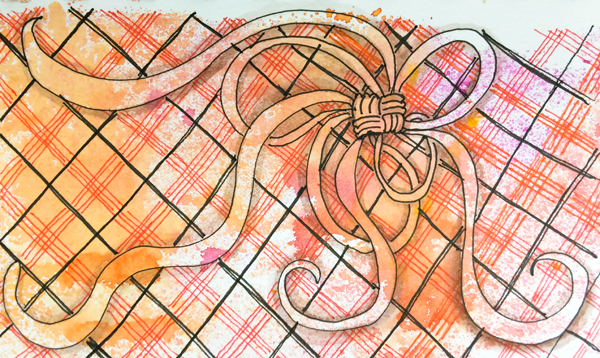 Love the color of the paper and the tangles on it!